In view of the major changes in criteria that had occurred between 1980 and 1987, the DSM-IV Substance Use Disorders Work Group was reluctant to make any additional major changes. 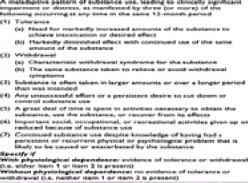 The nine items in DSM-IIIR were reduced to seven (two separate DSM-IIIR items, those referring to withdrawal and the use of drugs to treat withdrawal were combined into one item; another item was moved from the dependence to the abuse section). The repetitive nature of the problem was highlighted in that three or more of the items should have occurred during the same 12-month period and the associated difficulties must have led to clinically significant impairment or distress. DSM-IV also uniquely allows for the subtyping of dependence with and without physiological dependence ( Iable 3). ICD-10 includes six items under dependence, most of which are similar to DSM-IV. 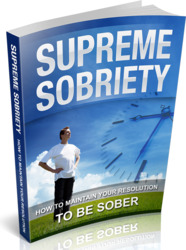 For a diagnosis of dependence, three or more items should have occurred in the past year. 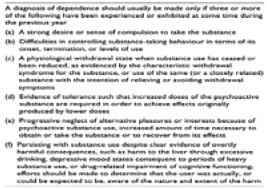 The 'strong desire or sense of compulsion to take the substance' is viewed as a central descriptive characteristic of dependence in ICD-10. This compulsive-use indicator is not included in the DSM-IIIR or DSM-IV concept of dependence (Table ! ).